Lord of the Rings poster by Jimmy Cauty (1976) | 'TAIN'T THE MEAT… IT'S THE HUMANITY! 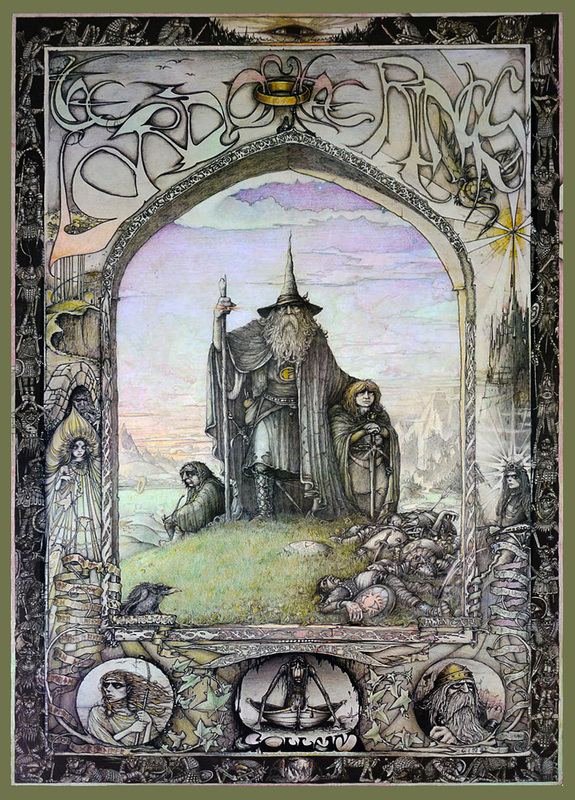 I’m going to continue in a Tolkien vein (click here for my post on Cees Kelfkens’ charming cover to the Dutch edition of The Hobbit) by highlighting this excellent Lord of the Rings poster by Jimmy Cauty released by Athena in 1976. Cauty, better remembered as one half of 1980s British acid-house band The KLF, painted this evocative image when he was only 17 years old. The print was released by high-street retailer Athena and quickly proved hugely popular. It’s easy to see why; the level of detail in the image is outstanding and Cauty clearly exhibits a tremendous affection for the subject matter. Not only does he include most of the book’s major players he also subtly works-in the ‘one ring to rule them all...’ inscription under the main title. I also like the border of Orcs around the outside edge and the creepy looking Gollum. Cauty’s Lord of the Rings poster also has a wonderfully trippy vibe, perfectly reflecting the novel’s standing as a counterculture icon of the late Sixties and early Seventies. The print was commissioned by Athena, who were a UK high-street mainstay throughout the Seventies and Eighties before going bust in 1995. They specialised in sepia-tinted posters of semi-naked men and women as well as airbrushed prints of celebrities – so pervasive were they that you’d have been hard-pressed to find a teenager during that period that didn’t have at least one Athena print on their bedroom wall. I had a couple myself but this version of Cauty’s Lord of the Rings, which is printed on an A4 block of cork, is the only one I still own. It’s followed me through numerous house moves and has been a firm fixture on one of my wall’s for over 30 years now. Not a bad recommendation really.